Main page polyethylene pipes , fittings , welding machines , Almaty - TOO "Plast Invest Production"
Dear visitors! Here you can request and our operators will contact you very soon! The guaranteed service life - 50 years. World class quality of polyethylene pipes. Need some advice ? Our experts will help you make the right choice . 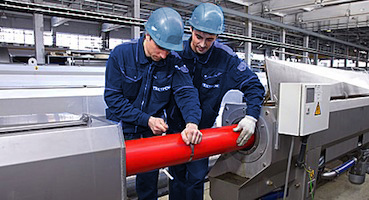 Polyethylene pipes are manufactured by extrusion. Granular polyethylene, high pressure low density HDPE 100 by loader fed into the extruder hopper where it is heated, plasticized, and a melt is supplied under pressure in a co-forming head from which the molded tube enters the calibrator, a vacuum bath then in the cooling bath. Pipes of «Plast Invest Production» LLP are made ​​on the newest equipment of Krauss Maffei Company, Germany. 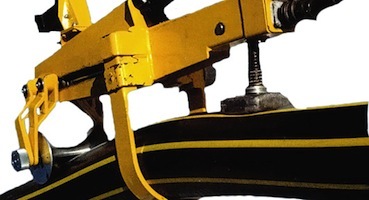 We use many years of experience gained by our company in the production of polyethylene pipes, innovative solutions of Krauss Maffei, highly skilled technical and production staff. «Plast Invest Production» LLP has its own certified laboratory that conducts testing of products in accordance with the certification field to manufactured products meet requirements of regulatory documents. Plast Invest Production company 10 years in the market of plastic pipes. During this time, the company has established itself as a reliable partner and supplier ! Welcome to «Plast Invest Production» LLP. For 10 years, our company strives to improve people's lives through the production of high-quality polyethylene pipe systems. «Plast Invest Production» LLP is a leader in the Republic of Kazakhstan for the production and supply of polyethylene pipe and fittings. In our work, we stick to simple principles: guarantee high quality of our products, provide the shortest delivery time, provide a flexible system of discounts for the greater convenience of our customers we are creating operational stocks in the warehouse. Because of this more and more enterprises trust us, and the geography of our business is growing steadily. The company staff is over 100 people. In September 2010 «Plast Invest Production» LLP has been certified by ISO9001-2008 standards, thus reaffirming the company's commitment to the ideals of the key matching the quality, time and cost of the projects. Using an innovative, reliable, modern equipment of KraussMaffei, talented staff, and responsible approach to business, as well as with its partners and customers, «Plast Invest Production» LLP will take You to new achievements! © 2013-2017 . Optional LLP "Plast Invest Production". All rights reserved.